Lexus IS Forum > Site News & FAQs > News > Industry News > Lexus quietly reveals the color choices for the upcoming Lexus IS C.
Lexus quietly reveals the color choices for the upcoming Lexus IS C.
Although the Lexus IS 250C that was on the Lexus stand at the 2009 Detroit Auto Show was the same well-traveled Matador Red Mica exterior with Alabaster interior car that went from Paris to Sydney to Los Angeles to Detroit (with Lord knows what other stops in between or still to come), showgoers at California's second-tier Auto Shows in San Diego (which ran from 31 December 2008 to 4 January 2009) and San José (which ran from 8 to 11 January 2009) got an unexpected treat: an IS 250C in the Lexus IS F's signature Ultrasonic Blue Pearl exterior colo(u)r, and yet another IS C-exclusive wheel design. 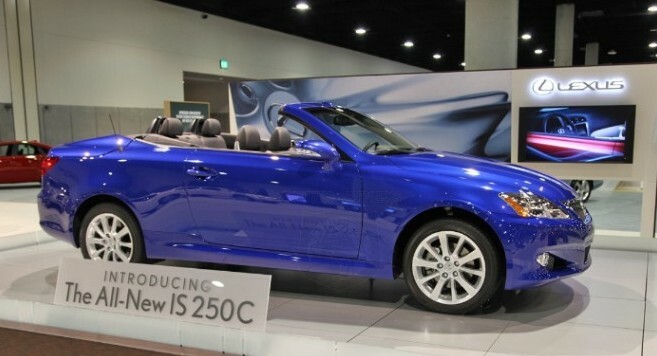 Just as quietly, the multiple exterior and interior colo(u)r combination options available for the IS C were placed in the "build your Lexus" kiosks located throughout the carmaker's Detroit Show stand. Besides Ultrasonic Blue Pearl, the IS C gets a second exclusive shade of blue, Cerulean Blue Metallic, which, if the computer monitors are anything to go by, appears to be a slightly darker riff on Breakwater Blue Metallic (which is NOT available on the IS C and thus remains a sedan-only color). As to interior colo(u)rs for the convertible coupe, three choices are available: Alabaster (the white-looking shade that we mistakenly assumed was the same Alpine White hue available on the IS F), Black and a somewhat unexpected Blue and Alabaster two-tone combination. The latter places the dark blue on the seat sides/bolsters and the alabaster along the wide central portion of the seats. Contrary to logical expectations, neither of the blue exteriors are available in conjunction with the Blue and Alabaster two-tone interior, as the diverse shades of blue seemingly would all clash. It finally seems like Lexus is heading in the right direction in terms of their IS lineup. Two-tone interiors and more "young", bright colors should have always been a given, knowing what the general IS enthusiast would probably prefer as opposed to people who are more interested in Lexus' other models. Glad you liked it, Leon. The two-tone interiors seem to be a new (and good, in my book) trend at Lexus. The HS250h hybrid will offer one, as well. Stay tuned for that Front Page article, which should be up later this week. Great write-up as usual. Sorry you had to make the trip from sunny Florida to freezing Detroit to get the scoop. Still no new info on lexus.com, though. I was hoping there would be an update during the Detroit show. It's been a while, since I've been on here, but I've been obsessing about this car lately. The convertible should be a 2010 model. I see the black interior as traditional leather, but the blue and white will likely be a variant of the pseudo-suede and not available on base models. The blue and white is not pseudo-suede/ecsaine/alcantara, but two-tone leather, just like the terra cotta and black interior option on the IS F.